Our first pelagic offshore Blue and Mako shark dive trip since June, so kicking off our Offshore Shark Diving season on a beautiful weather forecasted Saturday. 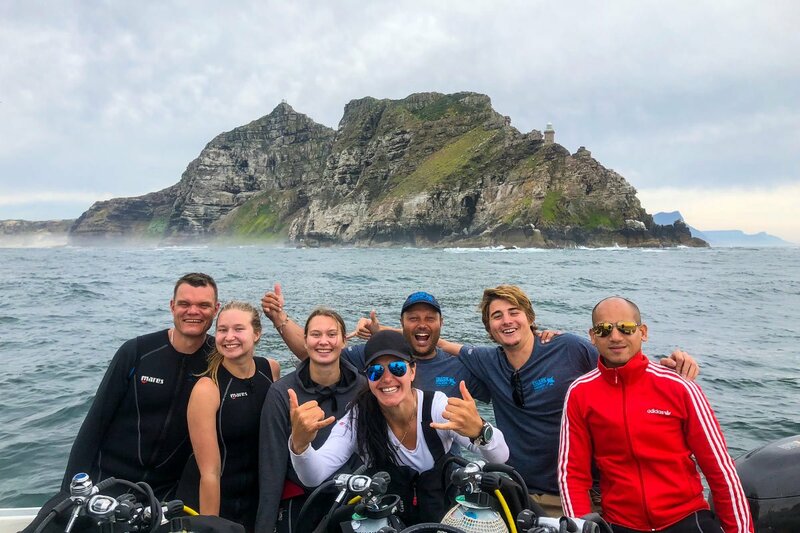 We had a lovely group that joined us, 4 awesome scuba diving clients. We left the pier at approximately 7:45am and all were very excited about this adventure. Heading out we had a smooth ride, until we got to Cape Point the South Western most tip of Africa, we took a lovely group photo, the weather was thankfully consistent and stunning all the way out to the offshore grounds. As we hit the 43 kilometre mark away from land, we stopped the boat and had a look at the water. We managed to find some clean bluey/green water and decided to start to bait and hope to find our elusive sharky friends. After around an hour or so we hadn’t had any luck and decided on a new location. Sometimes we have to change our location quite a few times in order to find where the sharks are congregating. It’s a big ocean out there and we are really like a needle in the haystack. However we have our hot spots that through experience we found the Sharks like to congregate in. There is a large tuna fishery in the same area that we are looking for the Blue Sharks and Makos, and we are fortunate enough to communicate with these vessels to also find out if there are sharks in the areas they are searching for fish. After 3 long chum lines/ bait lines, a good few hours of hard work and ground covered we managed to find 3 big Blue Sharks that we dove with. Sometimes good things are worth waiting for. These 3 big Blues were awesomely interactive with all our divers. We had a solid 72min dive which was absolutely incredible. So all in all our first trip for our season was a long one but highly successful and lots of happy divers!! !